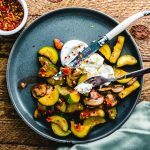 Easy Italian side dish of garlic sauteed zucchini and mushrooms topped with delicious burrata cheese. Chop or slice garlic. Slice zucchini lengthwise and chop into 1/4" half disks. Slice mushrooms. Chop Tomato. In a large pan turn heat to medium with 1/4 cup olive oil. Saute garlic for 1 minute, then add mushrooms. Turn heat to medium-high and saute mushrooms until they release their water. Continue to brown them for 2-3 minutes more after the water is evaporated. Turn heat back to medium and add the zucchini. Stir and if anything is sticking add a little bit more olive oil. Cook zucchini for 5-7 minutes, then add the tomatoes and cook for another 3-5 minutes. Add the oregano, salt, pepper, and optional crushed red pepper. Stir it all together and taste test. If necessary adjust salt and pepper. Total saute time will be 15-20 minutes. Finally, add the burrata on top and serve in the pan or plate, then top with the burrata. Add a nice drizzle of extra virgin olive on top of everything and serve with some more crushed red pepper and Italian bread on the side. Enjoy! Substitute a wet fresh mozzarella if unable to locate burrata. Salt is kept moderate on all our recipes so adjust according to taste.